For courses in algebra-based introductory physics. 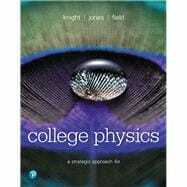 College Physics: A Strategic Approach, 4th Edition expands its focus from how mixed majors students learn physics to focusing on why these students learn physics. The authors apply the best results from educational research and Mastering™ Physics metadata to present basic physics in real world examples that engage students and connect physics with other fields, including biological sciences, architecture, and natural resources. From these connections, students not only learn in research-driven ways but also understand why they are taking the course and how it applies to other areas. Extensive new media and an interactive Pearson eText pique student interest while challenging misconceptions and fostering critical thinking. New examples, explanations, and problems use real data from research to show physics at work in relatable situations, and help students see that physics is the science underlying everything around them. A Strategic Approach, 4th Edition, encourages today’s students to understand the big picture, gain crucial problem-solving skills and come to class both prepared and confident. Mastering™ is the teaching and learning platform that empowers you to reach every student. By combining trusted author content with digital tools developed to engage students and emulate the office-hour experience, Mastering personalizes learning and often improves results for each student. With Learning Catalytics™ instructors can expand on key concepts and encourage student engagement during lecture through questions answered individually or in pairs and groups. Students also master concepts through book-specific Mastering Physics assignments, which provide hints and answer-specific feedback that build problem-solving skills. Mastering Physics now provides students with the new Physics Primer for remediation of math skills needed in the college physics course. Note: You are purchasing a standalone product; Mastering Physics does not come packaged with this content. Students, if interested in purchasing this title with Mastering Physics, ask your instructor for the correct package ISBN and Course ID. Instructors, contact your Pearson representative for more information. Randy Knight taught introductory physics for 32 years at Ohio State University and California Polytechnic State University, where he is Professor Emeritus of Physics. Professor Knight received a Ph.D. in physics from the University of California, Berkeley and was a post-doctoral fellow at the Harvard-Smithsonian Center for Astrophysics before joining the faculty at Ohio State University. It was at Ohio State that he began to learn about the research in physics education that, many years later, led to Five Easy Lessons: Strategies for Successful Physics Teaching and this book, as well as Physics for Scientists and Engineers: A Strategic Approach. Professor Knight’s research interests are in the fields of laser spectroscopy and environmental science. When he’s not in front of a computer, you can find Randy hiking, sea kayaking, playing the piano, or spending time with his wife Sally and their five cats. Brian Jones has won several teaching awards at Colorado State University during his 30 years teaching in the Department of Physics. His teaching focus in recent years has been the College Physics class, including writing problems for the MCAT exam and helping students review for this test. In 2011, Brian was awarded the Robert A. Millikan Medal of the American Association of Physics Teachers for his work as director of the Little Shop of Physics, a hands-on science outreach program. He is actively exploring the effectiveness of methods of informal science education and how to extend these lessons to the college classroom. Brian has been invited to give workshops on techniques of science instruction throughout the United States and in Belize, Chile, Ethiopia, Azerbaijan, Mexico, Slovenia, Norway, and Namibia. Brian and his wife Carol have dozens of fruit trees and bushes in their yard, including an apple tree that was propagated from a tree in Isaac Newton’s garden. Stuart Field has been interested in science and technology his whole life. While in school he built telescopes, electronic circuits, and computers. After attending Stanford University, he earned a Ph.D. at the University of Chicago, where he studied the properties of materials at ultralow temperatures. After completing a postdoctoral position at the Massachusetts Institute of Technology, he held a faculty position at the University of Michigan. Currently at Colorado State University, Stuart teaches a variety of physics courses, including algebra-based introductory physics, and was an early and enthusiastic adopter of Knight’s Physics for Scientists and Engineers. Stuart maintains an active research program in the area of superconductivity. Stuart enjoys Colorado’s great outdoors, where he is an avid mountain biker; he also plays in local ice hockey leagues. 1.7 Where Do We Go from Here? 4.4 What Do Forces Do? 27.1 Relativity: What’s It All About?